Greenberg Gibbons held a construction kick-off celebration today for Towson Row ― the $350 million mixed-use destination and new gateway to downtown Towson, MD. The company also announced that it has selected Gilbane Development Company to build the student housing portion of the project and Shamin Hotels to develop the hotel. 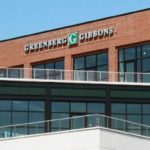 Greenberg Gibbons and Vanguard announced today that Foundry Row received the “Best Retail” Award of Excellence by commercial real estate development association NAIOP. Foundry Row, a former decaying manufacturing plant turned retail epicenter for Owings Mills, was awarded by the organization’s Maryland Chapter. Greenberg Gibbons announced today that Brian Gibbons has been named “Most Admired CEO” by The Daily Record. Gibbons is recognized as an innovative developer with high-profile projects because of his commitment to his values and his determination to overcome all obstacles. Learn about our new joint venture with Caves Valley Partners (CVP) to develop Towson Row, the $350 million mixed-use destination at the southern entry point of Downtown Towson. The two local development firms said they will collaborate on the 1.2 million-square-foot Towson Row project with Greenberg Gibbons spearheading the retail, residential, student housing and hotel components while CVP takes the lead on the office space. Ruth Shaw will be moving to The Shops at Kenilworth from its longtime location at the Village of Cross Keys in September 2017. It will join an established mix of fashion and beauty retailers from the Baltimore area, including South Moon Under, Jos. A. Bank and About Faces Day Spa and Salon. Trader Joe’s expanded Towson location will officially open at The Shops at Kenilworth on March 17. The funky grocer that offers its own brand of items like honey walnut shrimp, tomato feta soup and steak and stout pies will open its doors at 8 a.m The opening is the latest in a string of new retail at the small mall.